channelcentral develops cutting-edge software as a Service (SaaS) which is hosted centrally and securely. It holds highly personalised, complex and configured data for access anywhere, any time in the cloud. 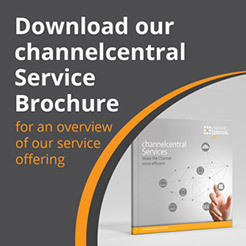 channelcentral owns the software and can integrate customer information, enabling you to host and login to your own bespoke platform which is managed on your behalf. Customers pay a quarterly subscription for the service, and channelcentral will provide all updates and support through a highly experienced team of developers.